William Charles Mikel was born in Belleville in 1866 and attended Belleville High School, and later Albert College. His post-secondary career began at Ontario Business College and culminated upon receiving his Bachelor of Civil Law degree from Toronto's Trinity College. Upon graduating he took up practice in Belleville where he achieved acclaim early on in his career as he successfully defended James Kane against a murder charge. Mikel was named Master of the Supreme Court of Canada for Belleville in 1928. He served as Crown Prosecutor throughout the Province of Ontario, as well as appearing before both the Provincial Legislature and the House of Commons. Of note amongst his government cases, Mikel was a member of Counsel for the Farmers Bank of Canada. In addition to this, Mikel was named King's Council in 1908 and was named head of the Ontario Municipal Association in 1907 and 1908. He was among those who founded the Ontario Bar Association and was named its President in 1911 and 1912. Mikel's public service is well noted as he was named Auditor and City Solicitor as well as being elected an Alderman for the City Belleville. In 1924 he was elected Mayor of Belleville with the largest majority the city had seen municipally or parliamentary. In 1925 he was elected once again, with a larger majority than the mandate he earned in 1924. Mikel was a Captain in the 15th Battalion, Argyll Light Infantry and upon the eruption of World War I, he volunteered for service but was turned down. Despite not being allowed to participate in the war, he nonetheless was able to recruit local organizations to mobilize their resources for use overseas. He also was active in local and national fraternal organizations. These include serving as the Master of the Moira Masonic Lodge, the Council Commander of the Woodmen of the World, President of the Canadian Fraternal Association from 1918 to 1919, Vice-President of the United Empire Loyalist Association of Canada in 1928, and Vice President of the Ontario Magistrates Association in 1928. Mayor Mikel was also an avid local historian. He set about writing one of the first recorded histories of Belleville, The City of Belleville History which was published in 1943. One of his ambitions was to see a "Quinte City" constructed, amalgamating villages, towns, and cities around the Bay of Quinte in Hastings and Prince Edward Counties. He died at his William Street home in 1950, and was survived by his wife Lillian and his daughter Audrey Milne-Jeffrey. Mikel Street in Northeast Belleville is named after him. The majority of the documents in the this collection have been attributed to the Mikel Papers or the Mikel Collection. 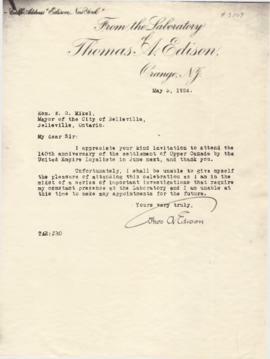 The Belleville Act of Incorporation as a City from 1878 is attributed to Mikel on the document but listed as donated by the Ponton family. The By-Laws and Regulations were donated by Mrs. A.M. Jeffrey. Two copies of God Love Mikel were donated by E.S.Denyes and the third by Gerald Boyce. This collection represents materials originating or used by W.C. Mikel. The first folder contains three speeches delivered during his time as Police Magistrate and Mayor. The next series of folders contains references and sources for his volume The City of Belleville History. The second folder contains correspondence regarding the book. Folders three through ten contain the notes Mikel used for each chapter. Folder eleven contains the plans for “Quinte City" and documents from the Town Planning Institute among others. Folder twelve contains unattributed reference material and general research for the book. Folder thirteen contains Mikel's collection of material for the 1924 United Empire Loyalist celebration which was held during his first term as Mayor. Folder fourteen contains Mrs. Mikel's obituary, a letter from Mikel to the Bank of Montreal, and a letterhead from the period he served as Police Magistrate. Folder fifteen contains three copies of his book, Godlove Mikel. The sixtenth folder contains a variety of newspaper clippings. Entered by Nicholas VanExan, June 24, 2015.